Why: PSSSST. We’ve got a secret... 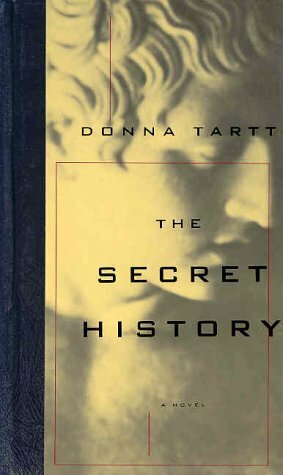 The Secret History is a pretty good book. Fine, we’ll admit the intro was a little sophomoric, but trust us when we say that nothing about The Secret History is jejune (Yep, we think that’s a pretty cool word too). The novel accounts the events surrounding narrator, Richard Papen, and his experience trying to fit into a small society of college elites (sorry, no super secret handshakes). The group is plenty intellectual and hand selected by an acclaimed, yet unconventional professor of Classics. Richard is intrigued and soon finds himself longing to be part of the group. Hesitantly, his membership is approved and almost at once yucky stuff hits the fan (figuratively, of course). What follows is a heavy helping of treachery, lying, arrogance, paranoia and... (commence foreboding music) murder. We found The Secret History to be very suspenseful and psychologically fulfilling. Probably our only gripe was that we didn’t quite get the ado surrounding professor Julian Marrow. The man is literally worshiped by his students, yet the one lecture glimpsed in the novel wasn’t all that profound. Frankly, we wouldn’t have signed up for his class. Okay, maybe we would have taken one of his classes, but rearrange our entire major and course offering as required by his prospective students?... ludicrous. Still, give this one a try – you probably won’t be disappointed! In the rare case you do experience prolonged feelings of dissatisfaction lasting longer than six hours, consult your local bookstore. Works by Dahl, Tolkien, Mitchell, Rowling, or Rennison should improve symptoms immediately.